Exploring blockchain potential or curbing shopping freedoms with conditional spending?On October 9th, 2018, the Commonwealth Bank of Australia (CBA) announced they are exploring a new payments trial called Making Money Smart. The Smart Money payments project is backed by an app-based system where blockchain technology is used to program money with a set of conditions. The trial is developed by Commonwealth Bank of Australia and CSIRO Data61. The idea is allegedly to enhance the financial wellbeing of participants and service provides, starting with the National Disability Insurance Scheme (NDIS). "The potential of this technology for the NDIS is exciting, ranging from greater empowerment for participants, reduced administration costs for businesses and greater visibility for Government." Yet, choosing to use a disabled demographic for the pilot may land the nation in some morally murky water. This is not the first time vulnerable Australians have been experimented on with payments trials. The government's Department of Social Services launched a cashless welfare card initiative to allegedly combat alcohol and drug abuse problems. Predictably, the welfare card's effectiveness has been unclear, according to the auditor general. People like single mother Ms Asusaar feel shame and stigma everytime they use the cashless card and people will often hide their cards in their sleeves to avoid judgemental stares. According to the Australian Council of Social Services (ACOSS) these feelings inflicted by the cashless card were a 'substantial issue' during the trials. 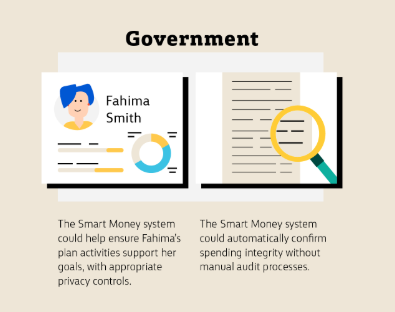 The Making Money Smart infographic introduced the character, Fahima, to represents an NDIS participant using Smart Money to 'maximise her choice and control' by handing over control of her finances to an automated budget, fee and receipt tracking app. Idyllic, except for the somewhat sinister caption under one of the last boxes: 'The Smart Money system could help ensure Fahima's pan actiities support her goals, with appropriate privacy controls'. This begs the question.. who oversees the privacy controls and how can anyone guarantee that they will not be hacked into? Only time will tell if the app succeeds, but the wise will likely avoid handing over the sense of choice, control and privacy that comes with manual auditing processes over a power-dependent app that pools all their savings into one digital interface. One thing is clear, while the government works with private companies to keep a sneaky eye on every cashless transaction, the world will be watching closely in case the big brother-esque payment prototype attempts to push out the one payment option that protects people's privacy indiscriminately. Every time Sylvia Asusaar lines up at the supermarket to pay for her groceries, she has to make a difficult decision. Participants of the latest trial say the card's stigma is negatively affecting their mental health. ACOSS says stigma and shame around the card is a "substantial" issue across all trial sites. It is not about how much money is in her account — she is instead worried about letting anyone see how she pays. The headline in The Australian was “Grog abuse drops under welfare card”. Human services minister Alan Tudge is reported as saying “There are very few other initiatives that have had such impact”. The box of results, headed “A better life”, quoted results including “41% of drinkers reported drinking alcohol less frequently” as did 37% of binge drinkers, along with 48% of gamblers and drug takers.